Are you ready to fly? These are our signature 8 week aerial arts series. 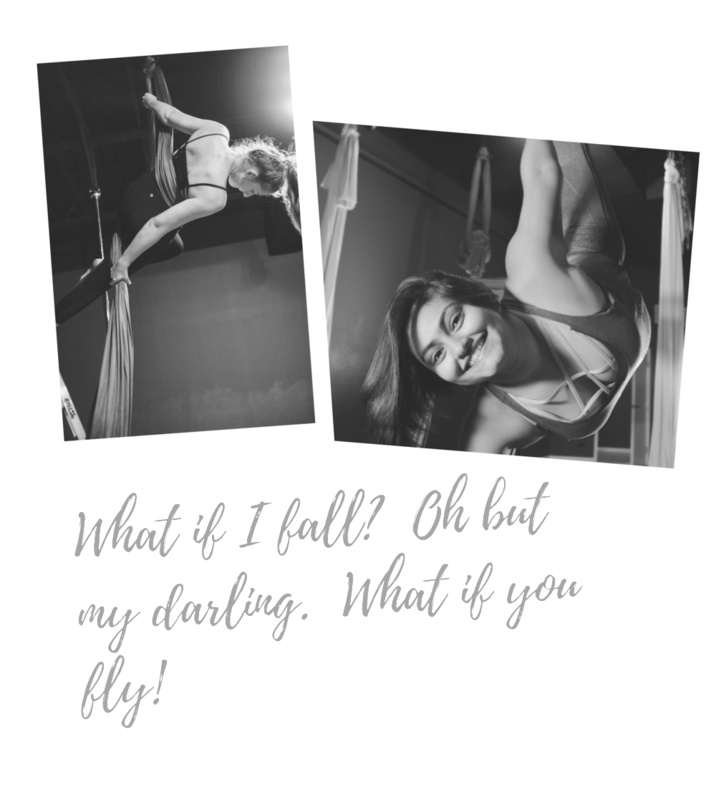 Choose from Aerial Hoop (Lyra), Aerial Silks, Aerial Sling, Aerial Yoga or Aerial Yoga Sculpt. Young women 14 and older are welcome in our adult classes. If your child is 9-13, check out our Kids Mixed Aerial class at the bottom of the page. For all of the classes listed below, please dress in leggings and a shirt that covers your underarms. We will be barefoot and you will need a mat. If you don’t have one handy, we rent them in the studio for $1. Prepare to fly! Called aerial “silks” or “tissue”, long lengths of fabric hang from a single point in the ceiling. You will be introduced to arm and leg holds and even climbing! You’ve seen it in Cirque and watched the artist “Pink” perform it on tv…now try it for yourself! This graceful art is challenging and dramatic. You’ll feel like an angel! Aerial Silks is a type of acrobatics performed while suspended in special, silky fabric. We use fabric to wrap, suspend, fall, swing, and spiral our bodies into and out of various positions. This class is circus inspired much like our aerial silks class. Incorporating gymnastic and acrobatic style moves, you use soft material in the shape of a hammock suspended from the ceiling to hold yourself off the ground and master a series of moves. Our aerial yoga classes combine the acrobatic arts with traditional hatha and vinyasa yoga. Asanas are done using a soft fabric sling that is suspended from the ceiling. It’s benefits include spinal decompression, pain relief and assistance in inversions and other poses. While being a great workout, and easy to modify, it is a good choice for newbies and seasoned yogis! This 90 minute class is challenging, but also comforting, playful, and energizing. You will leave feeling relaxed, lengthened and proud of yourself! This class is great to supplement your aerial or pole practice, providing strength training, flexibility training and stress relief! See you in class Yogi! Namaste'! This aerial practice combines yoga with suspension training, sculpting lean muscle mass while increasing metabolism, stamina, strength, and flexibility. Aerial hammocks will be used to take your movements to the next level. Expect an intense class that begins and ends with the bliss we all love in our aerial yoga practice. This class will cover all our aerial apparatus in a fun way that your 8-13 year old girl or boy will love! Girls older than 14 are welcome in our adult aerial classes.